January is a great time for making changes and after all that indulgence over Christmas many of us will be thinking about getting on the move and improving our health and fitness. This month is 'Walk Your Pet Month' which is perfectly timed seeing as it is the month for resolutions and "fresh starts." Walking our pets is not only important for physical exercise, but it is a great way to interact, explore, and relieve some of our energy. Far from being reserved just for dogs, 'Walk Your Pet Month' extends to cats also, which can benefit equally from a dose of fresh air and a great outdoor adventure! Whilst they might not be as easy to tether as their canine counterparts, a wide selection of cat-friendly collars, leads and harnesses are easily available these days, meaning no cat has to stay behind. Providing physical and mental enrichment is crucial for happy, healthy pets. Taking your animals on a walk is a great way to achieve both, and fulfils some of their natural instincts to explore and roam. It also satisfies a pet’s need for human company and interaction, while providing you the perfect exercise partner for keeping to your own resolutions! Taking your dog out walking regularly is also a great means to train and socialise, introducing your canine to new experiences that require obedience and discipline, as well as new faces, places, sights and sounds. A dog that is well socialised from an early age is more likely to be better behaved when it is older and to enjoy a more relaxed relationship with humans and other animals. All pets require different amounts of exercise to stay in good health. Large, traditional working dogs need an adequate amount of physical enrichment each day to avoid boredom and restlessness. Mental stimulation is also important as these dogs have evolved to utilise their intelligence and to put their various skills to good use. Smaller dog breeds require less in the way of physical exercise and are quite content to just frolic around indoors or in a fenced garden. 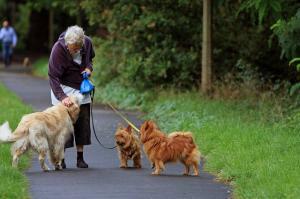 In a similar way, puppies and senior dogs need to be exercised far less than grown dogs. Dogs and cats that do not get enough exercise are prone to destructive behaviours and weight-related illness. Indoor cats might be safer than those in the great outdoors, but they are more likely to be over-fed by their owners and suffer from obesity. Smaller dogs also fall prey to this problem. You may already be walking your pet every day, but if it is something you do less regularly then we encourage you to partake in 'Walk Your Pet Month' this January! When walking at night, please be aware of potential dangers such as road traffic, poor visibility and getting lost. Ensuring you and your dog are well illuminated with reflective clothing is essential, as is carrying a fully-charged mobile phone and informing people beforehand of your planned course. For those of us that work long daytime hours, night-time strolls are the only solution. A bracing walk in the British outdoors is the perfect way to unwind after a busy day, although it is important to exercise greater caution at this time. Please read our related post Night-time Safety and make sure this 'Walk Your Pet Month' remains a safe and enjoyable one!